Welcome your wedding guests in style with this enchanting table. The candles and lighting add drama to this space. Barns or other venues with vaulted ceilings are a romantic choice for a winter ceremony. This space is particularly divine with its simple design and wintry vibe. Are ballrooms more your style? Then you’ll be crushing on this wow-worthy indoor ceremony with a tree-lined aisle. I love this bouquet filled with pinecones and accented with fabric details on the handle. This burlap ring bearer pillow should come with a "cuteness overload" warning label! Love all things rustic? Add an unexpected, whimsical touch with this pinecone installation. Try incorporating white flowers, candles, and metal tree centerpieces with crystal garlands for a dazzling effect. These glittery tablecloths are perfect for a glam winter-inspired celebration. Ghost chairs can be paired with rustic tables for an eclectic look or make a statement inside a glamorous ballroom. Drape faux furs over a few of the chairs to create a cozy look. For the perfect finishing touch, try adding a sprig of fir to the backs of your ceremony or reception chairs. Pine needle sprigs make for fun and creative place cards. Cinnamon sticks and tree slices are inexpensive ways to add holiday spirit to your winter-inspired nuptials. Add a sprig of rosemary or fir to your napkins for an aromatic touch as well. Don’t get me started on tablescapes — there is so much beautiful china, stemware, and flatware to choose from! Plus the crazy-gorgeous florals that line this winter-inspired display are just too amazing to pass up. Can we just talk about how adorable this mistletoe wedding cake designed by Erica OBrien is for a moment? An icicle cake? What a unique concept! Show your baker this inspiration photo from Cakeability Green. I'm Cake Opera Co.’s biggest fan girl. As if I needed another reason to love their confectionary creations even more, this hand painted cake with winter-inspired details has officially left me smitten for the season. Cake created by the Cake Opera Co. This is the crème de la crème of cake tables! Adding draping and candles instantly created a backdrop that was meant for a work of edible art. Hang clear ornaments inside your venue to add a touch of the holidays. Stop the madness — this marshmallow installation is too brilliant! Hang it over your dessert display. Remember cutting out snowflake shapes in elementary school for craft time? 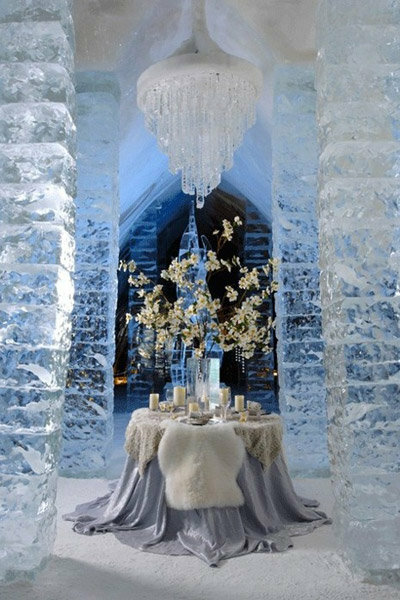 This is such a great way to bring a touch of winter wonderland to your dessert buffet.